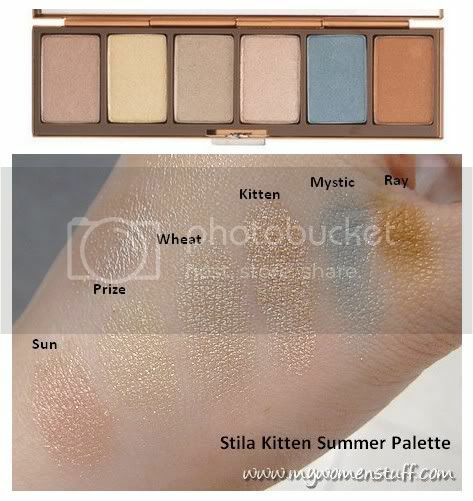 A while ago, I mentioned that Stila had a new eyeshadow palette for summer – the Kitten Palette. Well, last weekend I finally remembered it and got a chance to check it out! The first thing I noticed is that the Stila palettes have gone up in price. They are now retailing for RM190 each (6 colours) instead of the RM128 it was previously. Boo! So, even if I have good things to say about the Stila palette, I will balk at paying the terribly high price for what is a tiny little palette. Maybe I’ll try to source it from eleswhere. All the colours are shimmery and slightly on the sheer side. You can see that 4 of the colours look very light, while Mystic and Ray are much darker. These last 2 colours threw me for a loop. I know for a fact I’d never be able to pull Ray off as it is way too warm for my skin tone. So, that means if I get this palette, I’d only have 5 workable colours. Secondly, I already have a previous neutral Stila palette with Sun, Wheat and Kitten. That’s 3 out of 6 colours, 50% that I already own. So, paying for only 3 more new colours (1 of which doesn’t work for me) makes it a very expensive investment indeed! I guess this tells you that I’m passing on the Stila Kitten palette. Not because I dislike it, but simply because its too expensive for me to justify getting it. Now, if I could get it at a discount, I might change my mind altogether! NEXT POST: Return of the Pixie Haircut? I tried this palette but sadly they are all too similar and washed out on me. and I think the price is a bit steep for the tiny palette. Wow, thanks for the swatches. The colours are quite pretty, but how I wish they would release more exciting stuff. And gee the pricing is just not worth it. I hate it when they up the prices in Malaysia! Wow a free makeover? Thanks for the info! Connie: Stila used to be affordable but now its up there with the high end brands which is sucky. Nikki: Its really pretty honestly. I hope you get to see it soon! Jojoba: Yeah the colours show up, but the price was too horrendous. I wonder if Stila’s affected by that. rinnah: Better get it before the price goes up again! Monstro: Yep, paying RM198 for 3 new colours is shocking! prettybeautiful: It indeed is a lovely summer palette! Everything’s going up. i just stopped by Bobbi Brown to check out the new Mauve collection (which is gorgeous by the way! )… her eyeshadows are now RM70 (up RM10) and for a smaller amount! The SA tried to tell me that it was actually more, but I know for a fact that the old round packaging had 3.something grams and the new (more expensive) square packaging has only 2.something grams. Shame. I don’t know why she had to do that. Sorry kinda off topic but I had to vent.